The offices of ArcelorMittal are seen in Saint-Denis, oustide Paris, in 2008. The online piracy group Anonymous hacked into the Belgian website of the industrial giant on Friday, posting a video to protest the closure of two blast furnaces in Belgium. The online piracy group Anonymous hacked into the Belgian website of industrial giant ArcelorMittal on Friday, posting a video to protest the closure of two blast furnaces in Belgium. "Anonymous has done its work by attacking the ArcelorMittal site and, as you can see, it was a success," said a message posted alongside the video on the hacked homepage. The website was blocked in the morning before returning to service in the afternoon. ArcelorMittal, a multinational iron and steel group headquartered in Luxembourg, filed a complaint in court while the Grand Duchy's police opened an investigation for computer fraud. 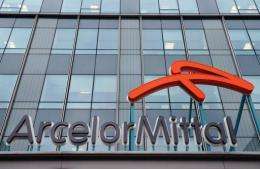 Anonymous Belgium had threatened to target ArcelorMittal on January 1 to punish the company for closing the two blast furnaces in the eastern city of Liege and cutting nearly 600 jobs. The hacker group has been involved in scores of hacking exploits including retaliatory attacks last year on companies perceived to be enemies of the anti-secrecy website WikiLeaks. Last month, Anonymous stole a trove of email addresses and credit card numbers from the website of US-based intelligence analysis firm Stratfor.